I’ve had this little sitting area set up in our dining room for a few years now. I loved the idea of having a seating area removed from the living room, but there were a couple of problems. 1) the couch, while comfortable, was super low and difficult for anyone over the age of 22 to hoist themselves up from, and 2) we just don’t need three sofas within a thousand square feet of each other. It was overkill. So this weekend I sold the sofa and coffee table on craigslist for a total of $175 and moved the lamp to the living room. I wasn’t quite sure what I would do with the newly empty space, but when I saw this little chair on craigslist for $20 I knew it would be a good starting point. I can’t believe I got it for that price. It’s in such great condition and newly upholstered. I would never have chosen that fabric myself but I dig it. And the cushion is super comfy. Fun fact: it turns out the previous owner was my sister’s college roommate! How funny! The old photo of this room was taken with a wide angle lens, so I had a hard time capturing the whole area in one shot with my new camera and stock lens. But you can see here that the chair is just chilling in the corner near the stairs. Juliet and Pistachio comprise the welcoming committee. I’m looking for a small chest of drawers to put next to it that can serve as a drinks station when we host parties. And then I’d love to fill the wall with family photos old and new. It’s nice that the room feels so much more open now. There’s more room for Jack to play and it’ll certainly be easier to keep clean. Sometimes less is more, ya know? Dining Room Frame Wall: Finally Complete! I hope you sent the mustard table to a good home. It was such a good color! Haha, I hope so too! She seemed like she would give it lots of love. 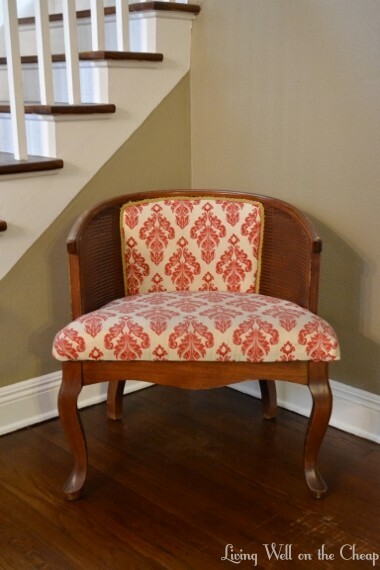 I so love this chair – you have a good eye, sweet Charlotte. Love the chair. So does Juliet! It is fresh meat for the tasting! Hahaha it is fresh and tasty!